A110-1 253 FT AGL ANTENNA 4000 FT EAST OF ARPT. A110-3 RY COND NOT MONITORED, RCMD VISUAL INSPECTION PRIOR TO LNDG. 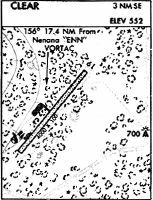 A110-4 BE ALERT: AVOID RESTRICTED AREA LOCATED 1 NM W OF ARPT & PVT AFLD LOCATED 3 NM SW.
A110-6 GLIDER ACTIVITY ON AND INVOF ARPT APR TO SEP.
A33-01/19 SAFETY AREA - 300 FT OVERRUN AT EACH END. A42-01 RY 01/19 MKD WITH THLD MARKERS. A81-APT ACTVT MIRL RY 01/19 - CTAF. A84 MARKED WITH FADED BARRELS, OVERGROWN WITH BRUSH.